I hope you’ve all having a wonderful weekend. I am because I was able to spend some time in my craft room. It’s always a bonus when I spend some time to play! 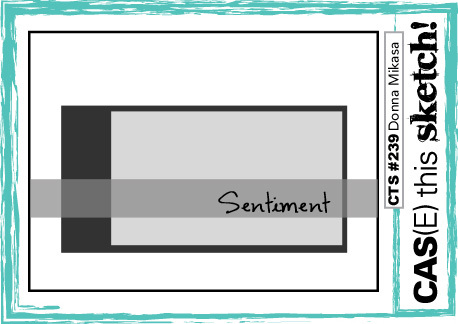 The card I’m sharing today is for two challenges – the sketch challenge at CAS(E) this Sketch and the colour challenge at Color Throwdown Countdown. You probably know by now that Graceful Garden is a favourite set of mine. I find it relaxing to watercolour and fussy cut these gorgeous roses. The colours I’ve used to watercolour them is Peekaboo Peach and Sweet Sugarplum. The sentiment I’ve used is from Blooms & Wishes and I’ve stamped this in Basic Black Archival Ink. My leaves are coloured with Old Olive. 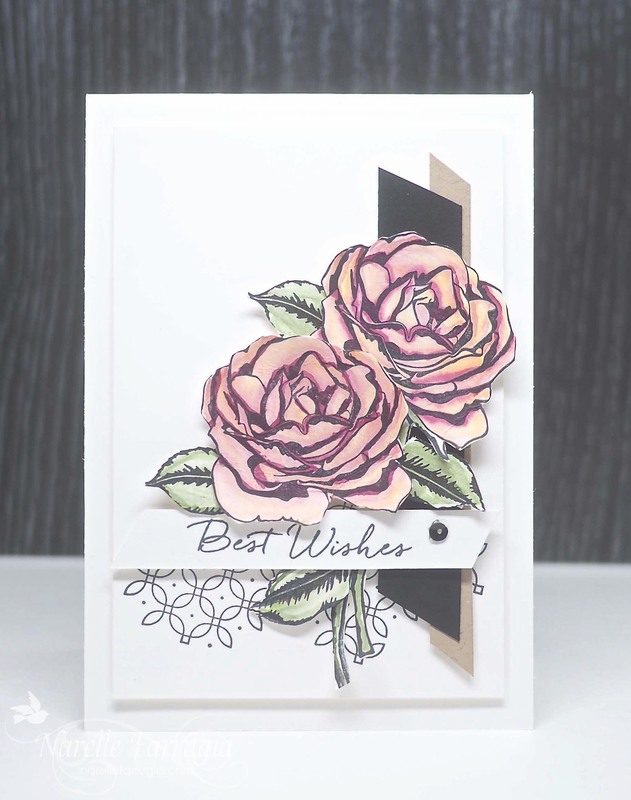 The card I’m sharing today is combined for two challenges – the sketch challenge at CAS(E) this Sketch and the colour challenge at Color Throwdown. These challenges combined effortlessly for me today – I love it when it all comes together in under an hour! Initially I was going to create a Christmas card, mainly because of the Merry Little Christmas DSP I had chosen, but then decided I wanted to go with a floral card instead. 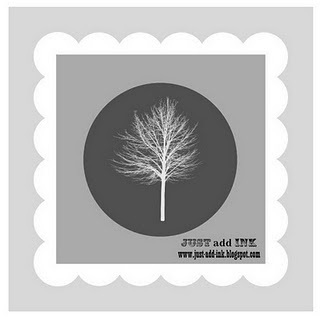 One of the things that I love about Stampin’ Up! DSPs is that the papers are so versatile. 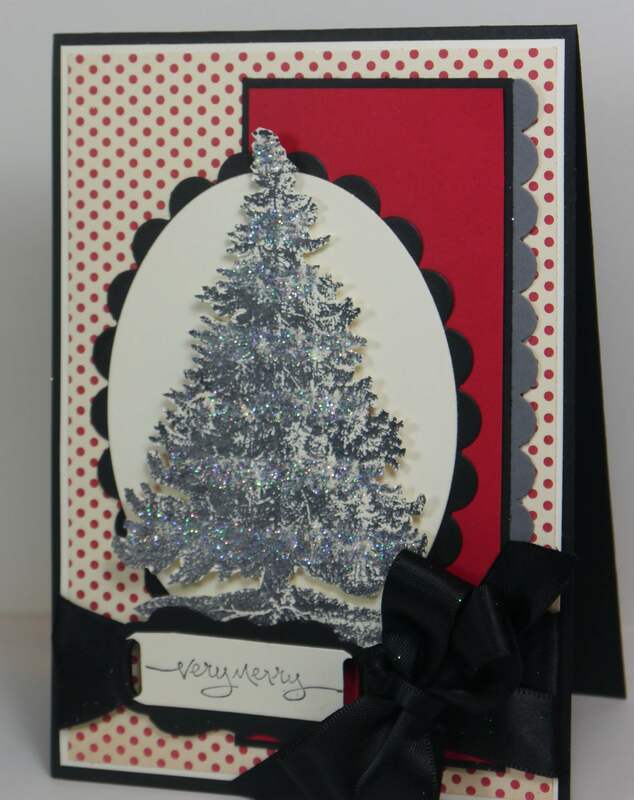 Even though this is a Christmas pack, the papers work well for any card. The orchids I’ve used are from a set called Climbing Orchid. After stamping the outline of my orchids in Basic Black Archival Ink, I watercoloured my flowers in Dapper Denim Ink. The outline of the leaves are also stamped in Basic Black Archival Ink and then the centre is watercoloured with Old Olive Ink. 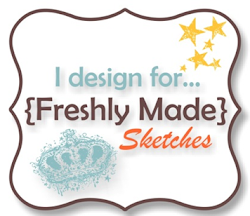 I looked at the MANY stamp sets I have and chose the sentiment from Feather Together as it worked well with the sketch. I also like the font that has been used in this set. The branch I’ve used is from Seasonal Layers Thinlit Dies – it ties my orchids and leaves together, I think…..
I’ve combined two challenges today – Just Add Ink sketch challenge and I used the colours from the Colour Throwdown Challenge. 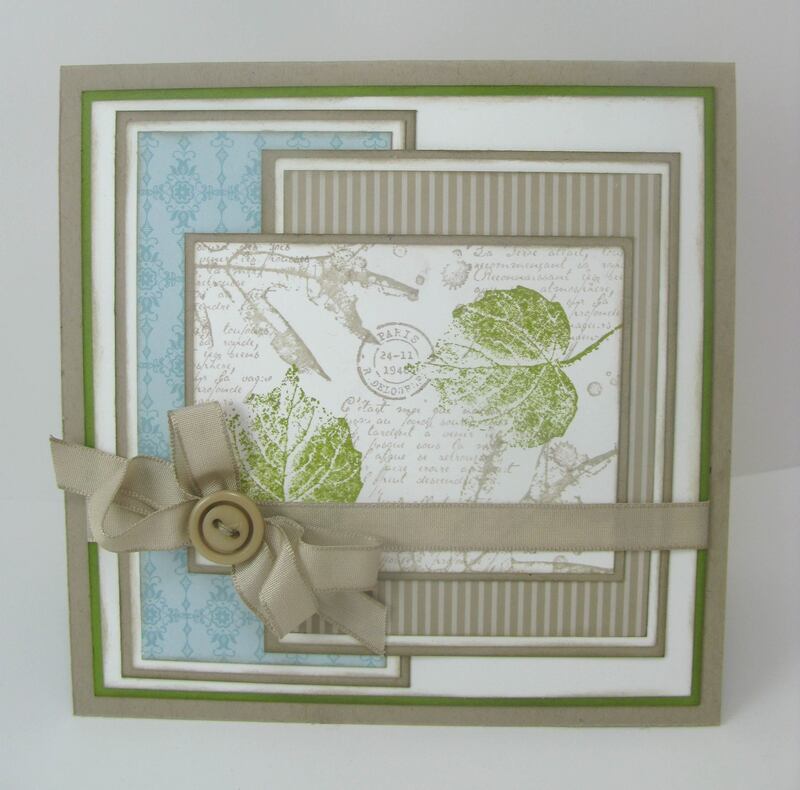 I pulled out my barely used Growing Green stamp set and stamped the leaves in Old Olive. Bit of fussy cutting involved, but I like them cut out. 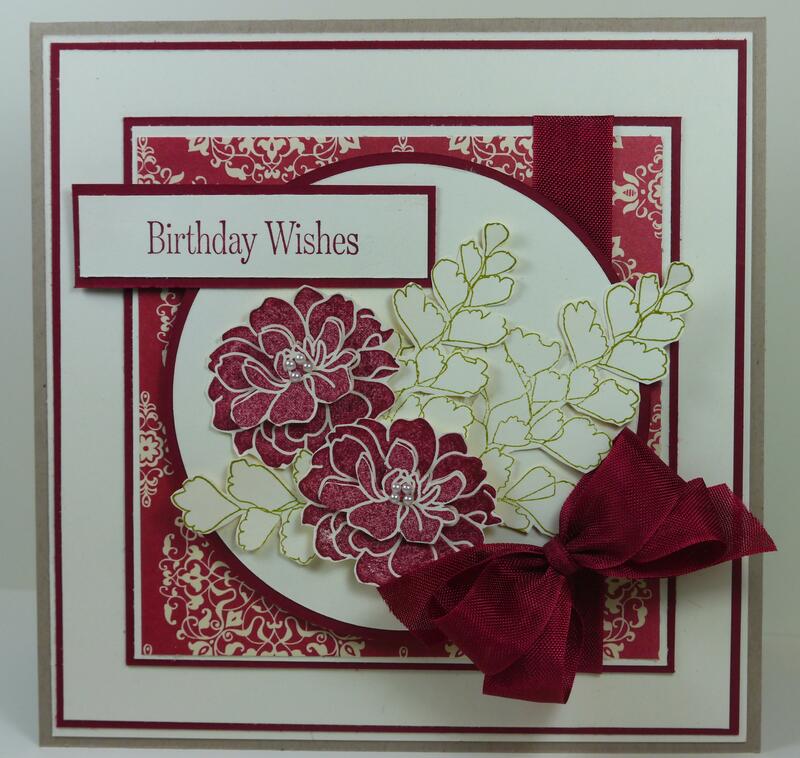 I then stamped the flowers from one of my new favourite sets – Fabulous Florets in Cherry Cobbler. I’ve stamped the images again and cut out the centre of them to raise them up to add more dimension to the flowers. I also added some of those pesky little pearls that I always lose and find stuck to me later on. 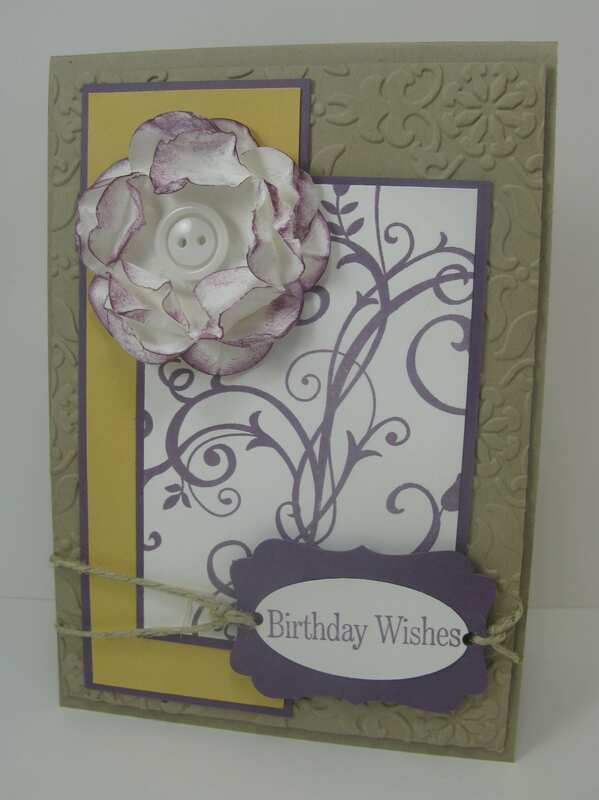 Love, love, love Stampin’ Up!’s seam binding – so after adding a sentiment to balance out the card I was done. 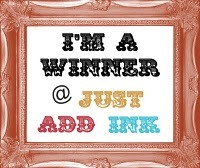 This card was the winner at Just Add Ink this week. 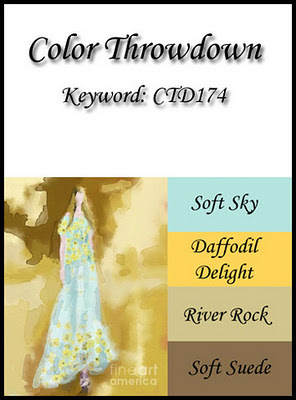 This card I’ve made is for the Colour Throwdown Challenge and for this weeks Friday Mashup Challenge. These colours threw me for a while as they’re not colours I would normally combine – that’s what challenges are great for, making me get out of my comfort zone and try new things. 1. 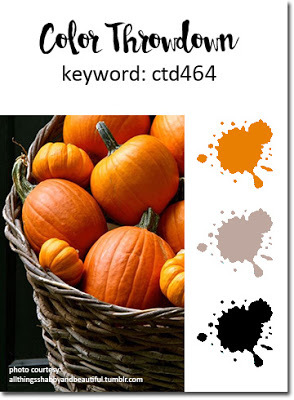 Make a “Thank You” themed Project. 2. Or Make a project “Using Designer/Patterned Paper”. 3. 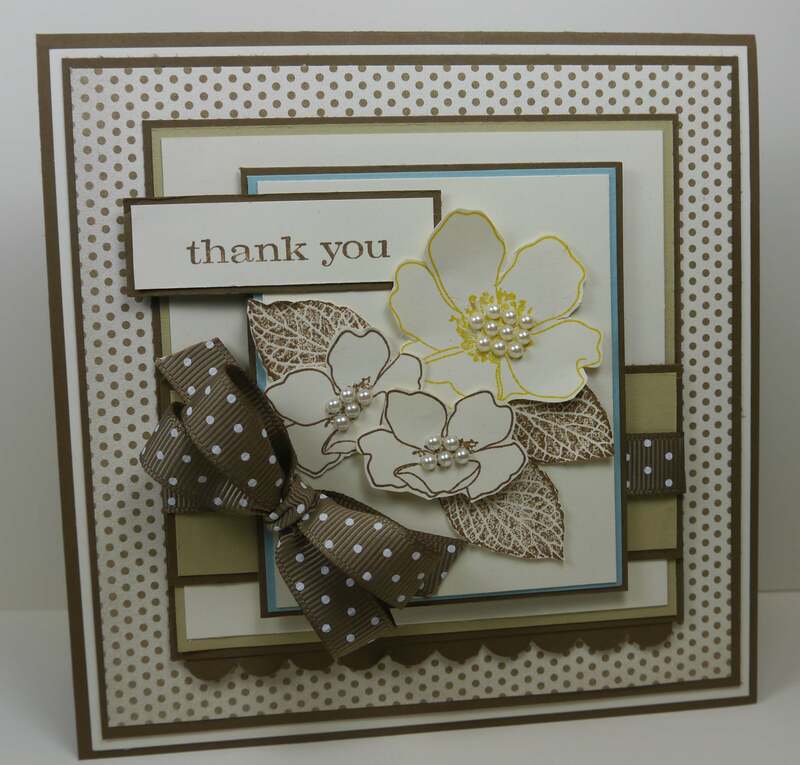 Or “Mash it Up” and create a “Thank You project with Designer/Patterned Paper”. 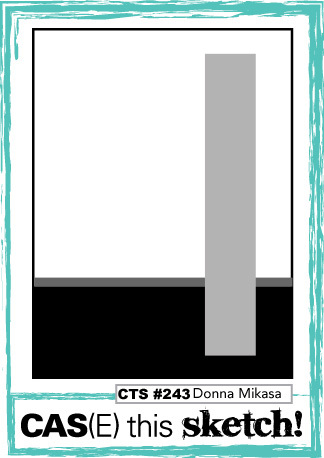 This card was chosen as “extraordinarily outstanding” at The Colour Throwdown Challenge this week! I’ve been quiet for a few days as we’ve been painting our house (not fun!) so I’ve haven’t had a chance to head to my craft room and play until today. 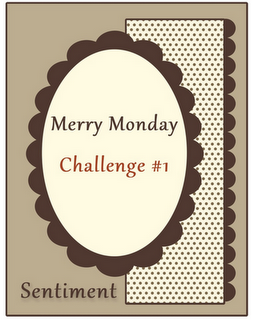 I’m combining challenges for this card – Colour Throwdown Challenge #173 & Merry Monday Challenge #1 (which I’ve just discovered on Lesley’s blog). I said in a post a couple of weeks ago that I was kinda over Christmas, but after finding Lesley’s challenge I think it’s a great idea to make a weekly Xmas cards and that way when Xmas sneaks up on me this year – I’ll be ready. It also gives me a chance to use my only used once Christmas set – Christmas Lodge. We don’t have this set in Australia yet so I had to buy it off ebay. Here’s a close up of frame that I made using Lots of Tags die in my big shot, my slot punch and threaded ribbon through to hold it down. It also shows how messy I am with dazzling diamonds! It seems that the weeks are just flying by and before we know it, it will be Christmas! Better get my shopping list together soon so I don’t leave it until the last minute like I normally do. 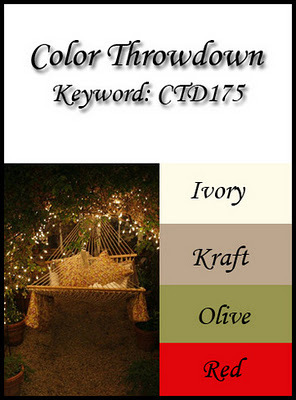 Anyway, my card tonight is for The Colour Throwdown Challenge and you can find their challenge blog by clicking here. Here’s their colour palette. 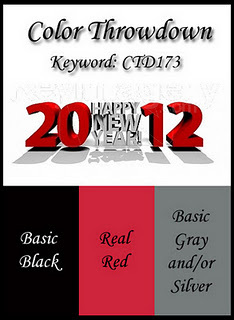 Here’s my card – not sure if I’m lovin’ it, but it’ll do. 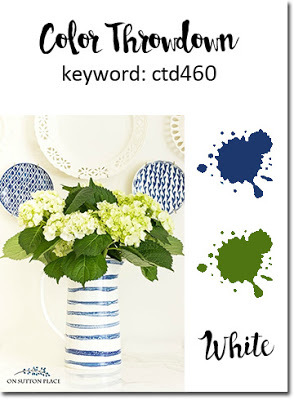 I came across Colour Throwdown Challenge a few weeks ago but haven’t had a chance to enter until this week. When I first saw these colours they threw me a bit, especially as we don’t have Pool Party in Australia yet, so I’ve substituted Pool Party with an old favourite – Baja Breeze. Not sure if you can tell by the photo but I daubed around every piece of card with Crumb Cake. Once I started daubing, I couldn’t stop. My poor old dauber was worn out by the end of it!